Router# indicates that you’re in privileged mode, where you can both view and change the router’s configuration. You can go back from privileged mode into user mode by using the disable command. The hot keys <Ctrl+Z> are equivalent to the end/return command in function. The command prompt contains a router name that can be configured as needed. Perform the following command in the global configuration mode or system view (VRP). Perform the following configuration in the privileged mode or user view (VRP). HH:MM:SS Current Time clock datetime ? MONTH Month of the Year clock datetime 12:00:00 ? Router#clock set 12:00:00 1 JUN ? Year clock datetime 12:00:00 2014-06-01 ? Router#clock set 12:00:00 1 JUN 2014 ? By typing the clock ? command, you’ll get a list of the next possible parameters and what they do. Notice that you should just keep typing a command, a space, and then a question mark until (carriage return) is your only option. Also notice that Router(config)#clock prompt reappears after the list of commands is displayed. By typing c?, we will receive a response listing all the commands that start with c. Question mark (?) help works the same way in both IOS and VRP operating systems. Banner or Header text is the greeting information the system displays when a user connects to the router, undergoes log-in authentication or conducts interactive configuration. secret Assign the privileged level secret [Huawei]super password ? Huawei VS Cisco – Which One is the better Choice for Ethernet Switches? 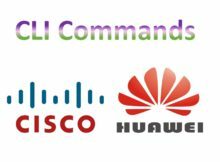 Previous: Huawei VS Cisco – Which One is the better Choice for Ethernet Switches?